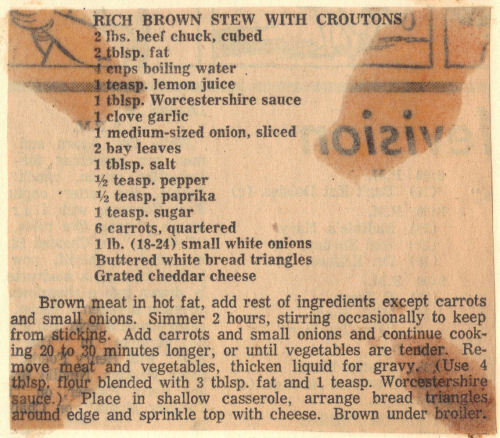 This vintage recipe was clipped from a newspaper then pasted onto an index card, it was found in a large collection, date unknown. I’ve typed it below along with a scanned copy. Brown meat in hot fat, add rest of ingredients except carrots and small onions. Simmer 2 hours, stirring occasionally to keep from sticking. Add carrots and small onions and continue cooking 20 to 30 minutes longer, or until vegetables are tender. Remove meat and vegetables, thicken liquid for gravy. (Use 4 tblsp. flour blended with 3 tblsp. fat and 1 teasp. Worcestershire sauce.) Place in shallow casserole, arrange bread triangles around edge and sprinkle top with cheese. Brown under broiler.